The Outlaws are kinda-sorta criminals – heroes acting as criminals, but their behavior isn’t too far removed from the type of folks their often up against. 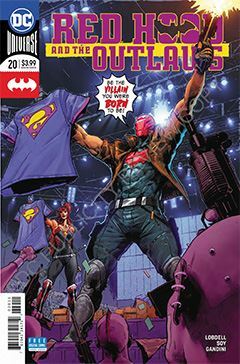 Red Hood breaks into the home of an arms merchant to threaten him with grave bodily harm if he doesn’t pack up his merch and return home. Bizarro has been endowed with superior intellect thanks to LexCorp technology, but he appears to have a hidden agenda. Red Hood and Artemis have yet to learn what it is, exactly, but as almost-criminals, neither of them is above a little subterfuge in an effort to find out. How Bizarro responds to that remains to be seen. This issue advances the narrative a little bit, planting seeds that will no doubt mature later. Not the least of which is where the various super-villains of the DCU obtain the lackeys and henchmen that do their bidding. It’s kind of like on Venture Brothers, where hunching is a viable career option – complete with unions, benefits and retirement plan. Dexter Soy is back in at the drawing board. He must be given credit for his consistent quality of work, issue after issue. It’s refreshing to see someone remain on a title, in this age of rotating artists. Scott Lobdell deserves equal praise for his stories. The book is surprising fresh, without descending into rehashed clichés and over-used story-telling techniques.